Thomas Jefferson (1743-1826) was one of the towering figures of the revolution, best remembered for his authorship of the Declaration of Independence and his service as the new nation’s third president. Jefferson was born in central Virginia, the son of an affluent planter. Like other wealthy Virginians, the young Jefferson was educated at William and Mary College, where he demonstrated an avid interest in numerous subjects: from the classics to law, from music to the physical sciences. In 1768 Jefferson began practising as a lawyer while working on the construction of Monticello, a large estate and palatial home not far from his birthplace. He was also active in politics at both county and provincial level, sitting as a deputy to the Virginia House of Burgesses from 1769. In 1774 Jefferson published A Summary View of the Rights of British America, one of the best known political tracts of the revolution. The following year Jefferson attended the second Continental Congress, where his reputation as a writer – along with his burgeoning friendship with John Adams – saw him handed responsibility for drafting the Declaration of Independence. In terms of ideas, Jefferson’s draft contained little of his own invention – but the Virginian’s eloquent turn of phrase, along with his familiarity with dozens of similar documents drafted in 1774-75, enabled him to produce a poetic synthesis of American revolutionary ideas. Jefferson returned to Virginian politics shortly after, serving as a legislator and, in 1779, succeeding Patrick Henry as state governor. In 1783 Jefferson returned to national politics, sitting in the Confederation Congress. Two years later he was appointed the de facto ambassador to France, where he remained for four years. His overseas service kept Jefferson at arm’s length from the drafting and ratification of the new constitution, however, he corresponded on the subject regularly with those involved, expressing caution and then lukewarm acceptance of the constitution. On his return to America Jefferson served as Washington’s secretary of state, John Adams’ vice president and, from 1801, president of the United States. 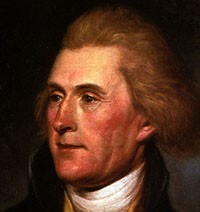 He remains one of the most complex and enigmatic of the ‘Founding Fathers’, but also one of the most respected.